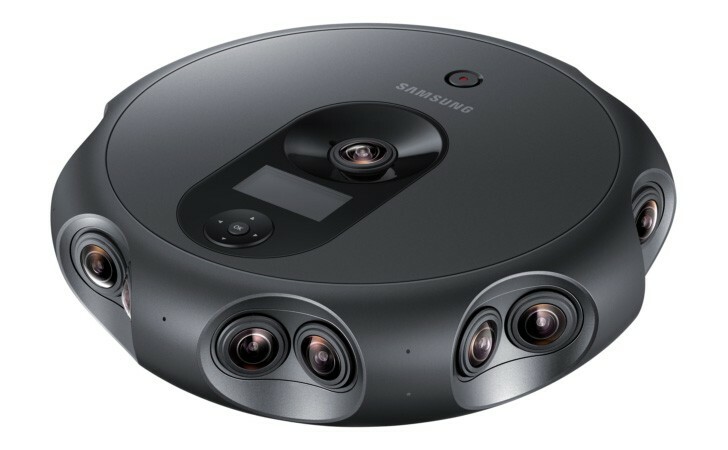 After years of development, the Samsung 360 Round is official. This a 360Â° camera that can stream VR content in a more professional setting, unlike the Gear 360. For one, it has a total of 17 cameras organized in 8 pairs plus one on the top. This allows it to stream immersive 4K 360Â° videos in 3D (something the Gear camera cannot do). If you’ve tried watching 360Â° video from a consumer camera, you’ll likely have noticed that it’s in 2D, which spoils the illusion. It takes pairs of cameras to create a 3D image with depth. High quality audio is supported out of the box with 6 internal mics for spatial audio plus 2 external microphone ports. The IP65 dust and water resistance means the camera can capture sights and sounds of some less than hospitable places. But this camera isn’t for the Average Joe. To do a live broadcast of its 4,096 x 2,048px / 30fps footage, you’ll need a Core i7-6950X processor with 32GB of RAM and two (!) Nvidia GTX 1080 Ti graphics cards. Post processing is easier, but you still need an i7 CPU and one GTX 1080 (non-Ti). The camera packs some impressive hardware of its own. Each of the 17 cameras has a 2MP sensor (1/2.8”) with an f/1.8 lens. It can record in H.265 to a microSD card (UHS-II is required) or an SSD (preferred). The camera already packs 40GB of eMMC and 10GB OF RAM (LPDDR3). To quickly transfer the large files, there’s a LAN port and USB-C.The Samsung 360 Round camera is not something you can carry in your pocket either, it weighs nearly 2kg. The price was not officially announced but some reports put it north of $10,000 (that’s a good deal cheaper than Nokia’z discontinued OZO cam). The camera will go on sale in the US later this month and expand to other regions later.